It really is sad that the thought of walking the perimeter of our densely wooded 2 little acres makes my skin crawl. 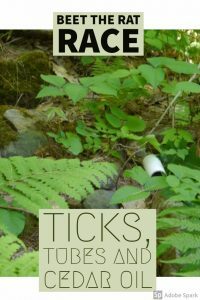 Between the ticks and the poison ivy, I have really not ventured beyond the cleared yard and driveway since we moved in to the place – outside of our wonderful snowy season when these issues are dormant for the most part. It is hard to get too adventurous when you have your hands full with the little kids, and trying to protect them is why I went out to walk the stone walls earlier this fall in the fading light. I just can’t bear the thought of the next generation growing up without a connection to the natural world due to a fear, a very valid fear, of the debilitating diseases that the ticks carry. It seems like every year now is a bad year for ticks, and this one was no exception. Luckily, most of what we have seen on our property have been dog ticks, but about once a week I happen to look down onto the top of my leg and find a teeny tiny deer tick. Why are the ickiest ones the tiniest? Well, this evening I took a step forward in combating them. I made my very own tick tubes and set out to strategically place them in spots where mice could find the fluffy and deadly contents. We now know that mice are responsible for infecting the majority of ticks carrying lime. 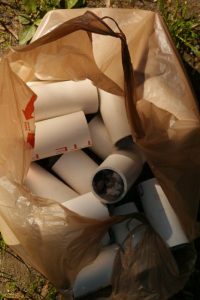 A mouse can have up to 100 ticks on its body, so why not take down the welcome sign and provide mouse nesting material laced with permethrin in a handy little tube tucked in prime mouse habitat. Of course these can be bought on Amazon, but it didn’t seem that hard to do this myself. I bought the Permethrin, collected some dryer lint, saved some toilet paper tubes and found a use for the random off cuts of PVC in the garage. I followed instructions on this site. Including the use of PPE, Personal Protective Equipment, ya know the mask and gloves. I bought diluted Permethrin though, so I didn’t have to worry about handling it too much. Since I have to wait till after the kids are in bed to get anything done, it is hard to find time to get geared up and head into the woods before dark. This evening I went out with my head lamp on and followed the stone walls that border most of our property. I tucked the tubes in about every 10′. I am happy that the white PVC will stand out enough to spot when I come back in a month or so to replenish the dryer lint. I am not sure how much lint we will create in the next month, the last batch took all winter to acquire, so I will have to find another source of fluff. I intend to make up another batch of tubes and fill in some of the gaps in between our commonly used areas and the property boundary. I have a few other tactics for combating ticks in the works as well. We have applied Cedar Oil to the part of the property where the dogs hang out on the edges of the driveway. We used a product called Yardsafe, but have now found that you can buy the concentrated Cedar Oil and apply it with a hose end applicator, which is much more cost effective. The product to use is PCO Choice for larger areas, we have 2 acres here. Unfortunately, Cedarcide is not able to ship to Maine since they are currently waiting permission, so oddly enough I could buy the same stuff from Cedarcide on Amazon. Cedarcide suggests applying monthly, which I think is a good idea for our first year using it. I think in subsequent years, we will apply a few times in the spring and a few times in the fall to break the nymph cycle. We also have chickens, who may or may not cut down on tick populations based on anecdotal evidence offered on Facebook tick discussion, but we have to keep them in large runs to protect them from predators (um, by predators, I mean our dog Birch). The runs can be rotated around the coop to different location each season, so I am sure they will find ticks here and there, but I am not expecting the chickens in our situation to put a major dent in the population. Ticks dry out very easily, so by letting more light into the yard, cleaning up leaf litter and keeping the lawn mowed, we will be able to easily maintain a safe space outside to enjoy without too much trouble. In the near future, I plan on mulching along the edges of the woods and planting a ton of tick deterring plants here there and everywhere – the place is going to smell so nice! Within the past few years ticks seem to be a very common point of discussion whenever the weather warms up here in Maine. Whenever people shrug and say, “well, what can you do?” without really meaning to ask a question, I shrug off the apathy and start rattling off all the possibilities. Now, I can point folks to this post and follow up with our progress, as anecdotal as it may be. Thanks for reading, good luck in your personal tick battle where ever you may be fighting it. 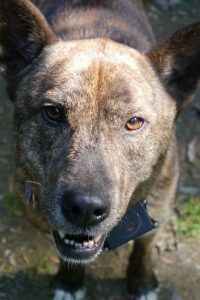 This entry was posted in Land Management, Outdoor Adventuring, Plant Life and tagged cedar oil, diy, garden, land management, Maine, pest control, pesticide, tick tubes, ticks by beettheratrace. Bookmark the permalink.